Gifts of radiant warmth, sunflowers are the happiest of flowers, and they symbolize loyalty and longevity. Much of the meaning of sunflowers stems from its namesake, the sun itself. Wild sunflowers are often photographed with their tall stalks and bright petals stretched towards the sun. This unique behavior, known as phototropism, is a motif that has appeared in many ancient myths and is viewed as a symbol of loyalty and constancy. Their physical resemblance to the sun has also influenced their meanings. The sunflower’s petals have been likened to bright yellow rays of sunshine, which evoke feelings of warmth and happiness. In addition, the sunflower is often associated with adoration and longevity. 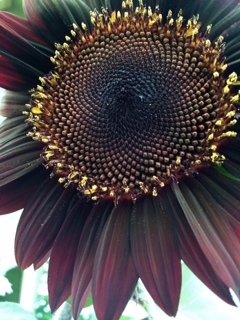 This week, I need to be a sunflower with my petals open to the sun and Kansas wind at my back. I planted a dozen seeds, tossed them without care into pots and empty plots. I have yet to see a standard yellow one, but am completely enthralled by this crimson-blood beauty who greets me every morning. Her dark petals wanted to hide from the lens, but I finally found sunlit ways to capture her face. She’s Beautiful, I love sunflowers. And thank you so much for your kind words from last night. You are a dear to worry about me sometimes and I totally understand when I haven’t heard much from a regular blogger. All is good here..just super busy now that I’m back to work. I hope to make it back over on WP later today…people like you make my life so much more peaceful and that’s always welcome on a Monday!! You’re welcome, just glad to know all is well with you, and dont let em work ya to hard. 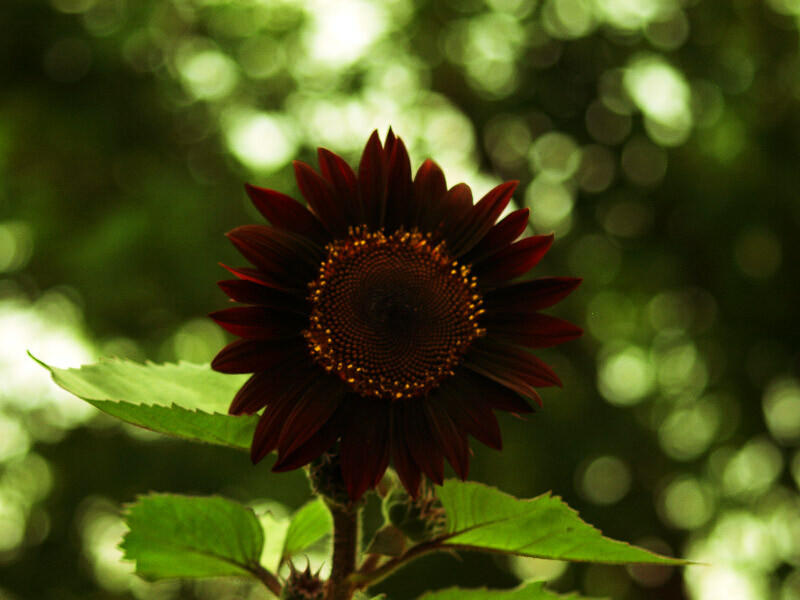 A crimson sunflower, wow! I’ve never seen one before! Hoping to get over to your side of the world very soon and get caught up on your honeymoon adventures! And this is the first crimson one I’ve seen, too. I’m going to save the seeds so I have more next year. The photos come nowhere close to showing off her pretty petals. That pretty girl inspired me all day yesterday and I just popped out look at her again. She is very red and beautiful today!